On August 26, 2012, the Wall Street Journal published a story describing a situation whereby a patient who sees a physician employed by a hospital essentially pays double out-of-pocket what they would have paid for the same exact office visit with a physician NOT employed by the hospital. I actually wrote about this situation in January 21, 2012. Beyond what the Wall Street Journal reported, what's going on? Assuming all things equal whereby a private practice physician and a hospital-based physician are equally competent and the supporting staff for each are both equally good (such assumptions are debatable in some circles, but will be ignored here), it all comes down to money. When a patient sees a private practice physician, the government-established fee schedule only incorporates payments to the physician. When a patient sees a hospital-based physician, the fee schedule not only incorporates physician payments, but also additional payments to the hospital. 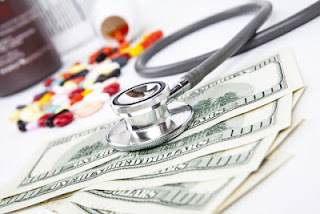 Now, the patient doesn't pay what insurance covers in either scenario, but typically there is a copay or coinsurance payment that the patient is responsible for that typically is 20% of the total charges. Here's an example using the Medicare fee schedule from 2002. I elected to provide "old" 2002 data as this information can be found easily and corroborated, but rest assured, the numbers are starkly different and perhaps more lopsided today. Medicare was selected as it is the bar to which all other insurance plans are typically based on. 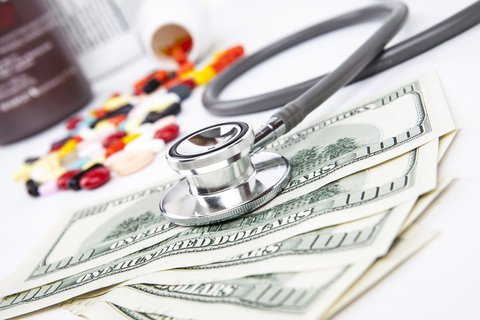 In a physician run private practice, the only charges that are incurred is from the "Physician Fee Schedule". In a hospital-based practice, a patient incurs not only the physician fee schedule, but also additional charges based on the "Outpatient Prospective Payment System". As you can see, the physician fees are slightly higher in the private practice setting compared to hospital-based practice... 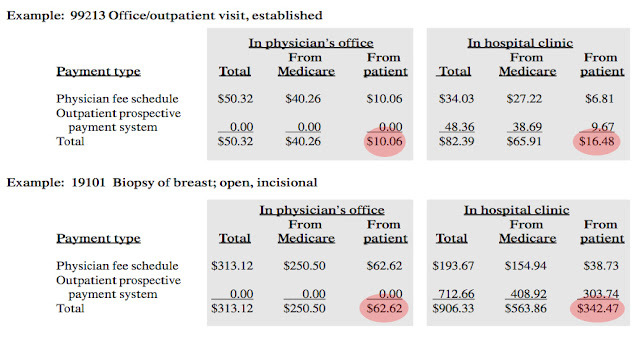 BUT, given the additional hospital charges involved with a hospital-based practice, the patient ends up being charged more per service for a simple clinic visit ($16.48) than if they had been seen in the private practice office ($10.06). The cost differential for the patient is far worse with any procedures ($62.62 versus $342.47). For the same exact procedure or service, a patient automatically ends up paying more to be seen in a hospital-based practice. This payment system is the same whether you go to a tertiary care teaching hospital like Massachusetts General Hospital or a tiny 98-bed community hospital. As an aside... for any physicians employed by a hospital, it behooves you to consider this differential payment in terms of how a hospital determines your salary and productivity. Do they consider ONLY the physician fee schedule or do they also take into account the outpatient prospective payment system? I should also mention that Congress is considering abolishing the outpatient prospective payment system for clinic visits only. Click here for more info. Hospital-Based Practice Versus Physician Private Practice. Fauquier ENT Blog 1/21/12.